The Israeli occupation uses many methods to take over land – from settlements and military camps to the nature reserve and political treaties. However, the Abu Haikal family of Tel Rumeida in Al-Khalil (Hebron), faces a much more unexpected enemy: archaeologists. 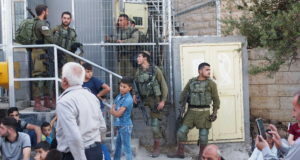 Currently, the family home is completely surrounded by an Israeli archaeological excavation – there is only one gate into the property, which can be shut at any time, leaving the family isolated from the surrounding city. The Israel Antiquities Authority (IAA) archaeologists – many of whom live in the surrounding illegal settlements – began digging in Tel Rumeida on Janury 5th, 2014. They claimed they were looking for the graves of Jesse and Ruth, figures from the Hebrew Bible. The IAA has also stated their intent to turn the area into a ‘Biblical Archaeological Park’, depending in what the dig turns up. (Above text written by the International Women’s Peace Service). Since the IAA began the dig in Tel Rumeida, the Abu Haikal family have been subject to threats, violence, and general criminal activity on their own land, such as plans to destroy or move an ancient olive tree belonging to the family. 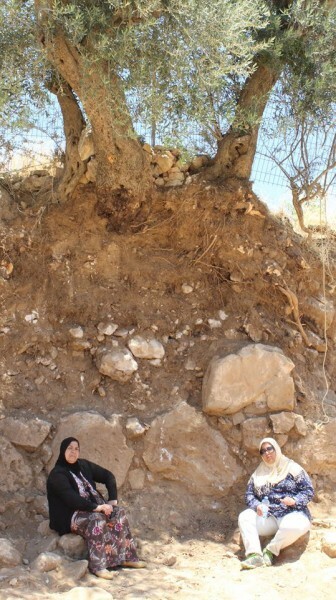 Feryal and Arwa Abu Haikal sitting under their olive tree, trying to protect it from damage or destruction (photo from https://www.facebook.com/groups/Save.telrumeida/). 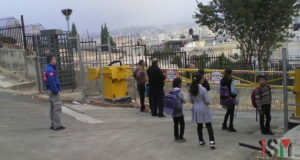 Now the family are calling out for a letter writing campaign to the Israel Antiquities Authority. 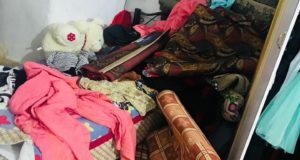 The letters should complain about the criminal activity in Tel Rumeida and demand that the IAA intervene and put a stop to these breaches of law. The IAA have an online form for contact on their website, so please write your own letter or copy the one below. I was shocked to hear reports of officials and workers of the Israel Antiquities Authority being involved in criminal activities in Tel Rumeida, Hebron. Apparently they have been involved in criminal damage to neighbouring properties, trespass, assault on international observers and damage to cultural heritage. Emmanuel Eisenberg appears to believe that he is above the law. He has been filmed making racist comments and issuing threats to the Palestinian residents of the area. For the IAA to retain any credibility I would think you would need to discipline him and hold him to account. This criminal activity and damage to cultural relics strengthens the perception that many people hold that IAA’s activities in Tel Rumeida are not guided by principles of scientific archaeology but are a political ploy to enable extremist Jewish settlers to steal more land from Palestinians, which is contrary to international law. I trust you will act speedily in this matter before any more property is damaged, trees destroyed or people injured.